Nato's new secretary general, Jens Stoltenberg, says the alliance wants constructive ties with Russia - but Russian policy in Ukraine must change. On his first day as head of the 28-nation alliance he said "we need to see clear changes in Russia's actions". 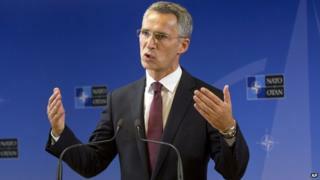 Nato accuses Russia of supporting pro-Russian separatists in eastern Ukraine with heavy weapons and soldiers. Russia admits only that Russian "volunteers" have gone there. Shelling in Donetsk has jeopardised a ceasefire. "We have to see that Russia changes its behaviour and its actions and returns to compliance with international law and its obligations," Mr Stoltenberg told a news conference in Brussels. A former prime minister of Norway and centre-left politician, he has taken over the Nato job from Anders Fogh Rasmussen, a former conservative prime minister in Denmark. Nato is bolstering its presence in the former communist countries on Russia's western borders, which are now Nato members. "I see no contradiction between a strong Nato and our continued effort to build a constructive relationship with Russia," Mr Stoltenberg said. He said Nato would continue to support Ukraine as an "independent, sovereign and stable" nation. Ukraine is not in Nato, but the alliance says member states are free to supply weapons to Ukraine if they want to. Since Russia annexed Crimea in March, forcing Ukraine to abandon its bases there, Nato has halted practical co-operation with Russia but kept political channels open.